I’ve been learning Flamenco for about a year now. I don’t have any other dance experience (other than some ballet lessons at the age of 7 MANY years ago). I joined a local flamenco class out of curiosity (and to have something different to talk about on internet dates!) and by the end of lesson 1, I was hooked. 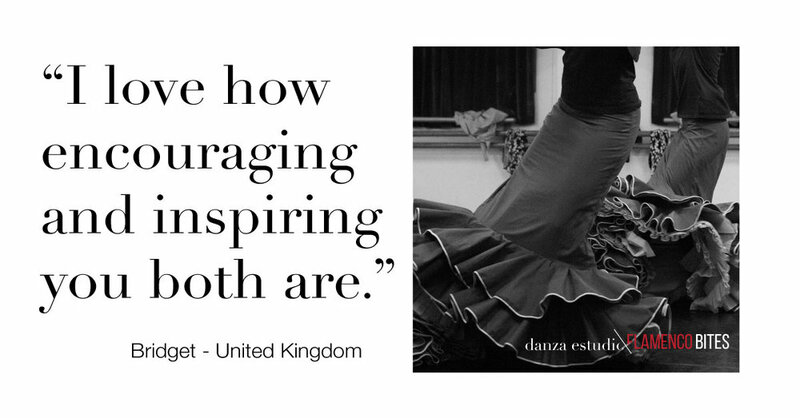 What was your biggest worry about joining danza estudio Flamenco Bites? Did it come true, and if not, what happened instead? To be honest I didn’t really have any major worries because I knew I wasn't going to be tied to a long contract. I suppose, if anything, I wondered what more you could offer given all the fabulous free stuff you generously provide on your website and youtube etc. Having joined, I quickly realised that the answer is ‘huge amounts’. I’m a little bit like a kid in a sweet shop, completely spoilt for choice and not knowing what to explore next. Again hard to answer as I love the wide range of lessons, information and advice you offer. I can always find an answer to any question I might have. If I was pushed to single one thing out, I suppose it would be that you are both there for us, happy to answer our questions and comment on our technique - I love how encouraging and inspiring you both are. Do it - you’ve nothing to lose and everything to gain! Whatever your level, there is a wide range of lessons, choreography, information and help available covering all sorts of topics. Plus if you have a specific problem or question Renae and Jose will happily help with that. Thank you Bridget for sharing your experience of deFB membership with everyone! We're on a mission this month to reach 100 members and we'd love it if you could join us. Click here to learn more.